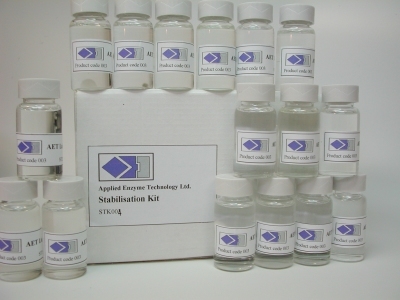 The enzyme/protein stabilisation kit comprises of 9 stabiliser formulations which have been designed to meet the majority of the stability issues encountered by clients working both in industry and academia. The kit stabilises the majority of enzymes and proteins including both conjugated and unconjugated antibodies both in liquid formulations and dry formulations. The flexibility of the kit allows the investigator to use their own buffer systems, pH ionic strength etc. The formulations are made up in a concentrated form thus allowing for different buffer compositions and pH criteria. To date AET has stabilised over 50 enzymes/proteins in both liquid and dry forms. Most of the enzymes listed above have been stabilised individually. However, certain enzymes have been successfully combined to made stable working enzyme cocktails. Most contract research has led to the generation of stable enzyme formulations from between 50 days to over 18 months at temperatures up to 50°C. The data generated addresses both the issues of increased shelf life and the operational stability of the enzyme system in question. Listed below are some of the examples in which our stabilisation technology is currently being used and can be used in the future. We supply bulk quantities of final stabiliser formulations.